There's no place like home. Juan Vazquez, Lone Star Park at Grand Prairie's all-time win leader, defeated nine of the nation's top Quarter Horse jockeys last Friday night to win the second annual American Quarter Horse Association (AQHA) Jockey Championship at the Grand Prairie, Texas racetrack. Vazquez, 34, clinched the title with a win in the final race of the unique four-race competition to finish the series with 24 points, three more than runner-up Alvin "Bubba" Brossette and five more than third-place finisher Jacky Martin. "When I crossed the finish line, I was screaming," said Vazquez, who began riding professionally in 1992. "I was really happy." Ten jockeys were invited to compete in the popular charity event that aids injured and disabled jockeys. The all-star lineup accumulated points based on where their randomly drawn mounts finished in each of the Jockey Championship races: first, 12 points; second, 6 points; third, 4 points; fourth, 3 points, and a late scratch 1 point. The jockey with the most points was crowned champion. Vazquez's victory on The Jovial in the final leg was his second on the night. He also captured the first race in the series aboard Kito Jet. Both wins accounted for his 24 points. Vazquez, a native of San Miguel, Mexico, needed a win in the final race to get the title. He trailed Martin and Brossette, who had 19 and 18 points, respectively. 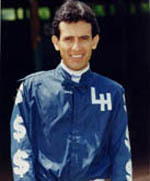 Brossette, who finished second in the second leg and first aboard Plataoro in the third leg, finished fourth in the final race to add three points to his total. Martin, who won the second leg on Lady Jet Steel, wound up fifth in the final race and finished with 19 points. One of his mounts scratched, and another was second in the third leg to account for the remainder of his points. "There were some real nice horses in that [final] race," Vazquez said. "But my horse ran a great race. Good horses make good jockeys. I'm really enjoying this moment. I got lucky tonight." Dennis Means, the winner of this year's All American Futurity on Ausual Suspect, finished fourth with 11 points, followed by G.R. Carter Jr. (10 points), Dusty Stimpson (10), Gilbert Ortiz (4), Joe Badilla Jr. (3), defending event champ Eddie Cox Jr. (0) and Sam Thompson (0). "I'm really honored," Vazquez said. "I'm glad to ride with all of these great jockeys. I really enjoy their company." Vazquez, who has ridden a record 114 winners at Lone Star Park's Fall Meeting of Champions since 1997, earned $6,000 for the win, while Brossette bagged $4,000. Martin and Means earned $3000 and $2000, respectively. All others collected $1,000. "I'm just happy to be included in the top ten jockeys in the country," Vazquez said. "We were all here to have a good time." This was the second straight year Lone Star Park has carded the AQHA Jockey Championship, an event patterned after the popular National Thoroughbred Racing Association (NTRA) All-Star Jockey Championship for Thoroughbred race riders each June. One-percent of the money wagered on the four Jockey Championship races and All Star Wager will be donated to the Jockey's Guild Disabled Rider's Fund. Vazquez, a winner of more than 600 races and $5.2 million, is the regular rider of top 3-year-old Pivotal Decision, who won the Grade 1 Dash For Cash Derby at Lone Star Park on October 12 - one year after winning the Dash For Cash Futurity. He's in the midst of his finest season, earning a career-high $1.3 million.